Want to diversify your garden? Join the Vancouver Plant and Seed Exchange Network, an initiative of the Environmental Youth Alliance. Trade seeds, trade plants, and connect with local gardeners. If you’re interested in seed saving, the Urban Seedkeepers Program may be for you. Through the program, EYA will train, educate, and support 20 individuals with growing space on how to save their own seeds. In exchange the seeds will be donated back to EYA for our Community Nursery Project. This is a great way for people to learn how to save their own seeds, contribute to biodiversity and our city’s seed security, and support EYA! This year’s UBC Farm dinner with Chef Robert Belcham of Refuel is on Monday, July 19th at 4:00pm. 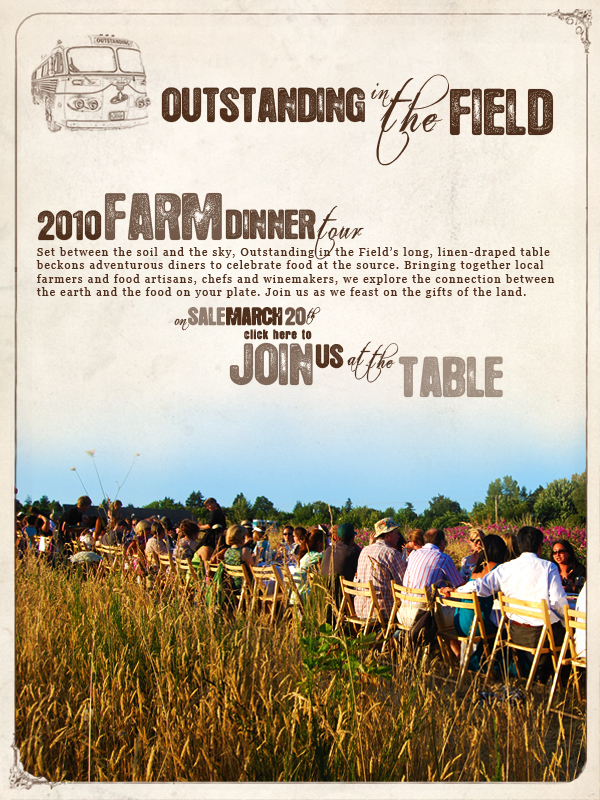 Tickets available for purchase through the Outstanding in the Field website. Update: The OITF ticket sales system was not working today; they are currently in the process of scheduling an new release date so everyone has an equal opportunity to purchase tickets. Tickets will now go on sale Saturday, March 27th at 9am PT/12pm ET. first harvest of 2010 – yay! baby onions – grow grow grow! BCAFM Conference – Free for students! The BC Association of Farmers’ Markets Conference & Marketing Caravan is 10 days away! Speaker Sessions: * Q&A with Honourable Steve Thomson, Minister of Agriculture & Lands * Jolene Brown – Award winning international speaker, marketing expert and farmer. * Annemarie Pedersen – Public & media relations expert, specializing in agriculture.